It doesn't matter if the hardware requirements keep rising every few years, keeps improvements and economy running. At least as long as gaming experience is worth it. However - I highly suspect you are also progressing in graphics API in one of the next releases - Direc3D11 and OpenGL *IS* already outdated - even if not for TRS2019 yet. At least I looking forward it. I will enjoy this game because my PC is a gaming one and it has got excellent performance. no shock that the development is being done mostly for PC. Macs can't keep up, it's quite rude to demand the stuff for mac when your mac toasters can't run the game. Just look at those visuals, no mac will smoothly run it at high settings. But AMD guys deserve the same attention as us Nvidia users. The whole "Nvidia is better then AMD" mindset is not a good one to have. AMD cards and processors are capable of a lot, and that should be recognized. Just my 2 cents. I previously states I was never gonna buy another Trainz product again, but I guess we'll see, this one looks pretty nice. Oh, and while AMD's next high end cards might take a while to put the company on more stable financial basis we might see some blue "Intel's first discrete GPU coming in 2020". More vendors to choose from, more variety, more options, more use cases for open standards. Yay! I am NOT demanding anything mate ,no more than any other users, all I want to know is what i need to run TANE on a current Mac and whether the current AMD cards that ship with macs on the market will run the game. I would like to know just how you have worked out that NO mac will run it, are you a mac expert and speaking from experience of running TANE in the current iMacs? I think the current iMac with an 8gb AMD RX 580 should be ok to run at high settings, since my 10 year old 6 core Mac Pro is not as fast as that and can still chug along with a 2gb gtx 680 ,can you give me a reason why it shouldn't be ? Now I wont defend apple for cost ( the iMAc pro is insanely expensive) and their selection of graphics cards in the past has hamstrung most of their machines., but i do get cheesed off when people who obviously don't use macs come in and make all encompassing statements and IMHO are pretty rude themselves to a whole section of users of the software----- ' toasters ' indeed ! Would you care to tell us just what is wrong with these specs to run the 2019 version at high settings ? if I am wrong then perhaps Tony Hilliam will put me right . it can go up to this spec, why would'nt that run 2019 verison ? The thing in current mAcs is that they are stuck with OpenGL 4.1 from 2010. Even if the hardware is more powerful - the software can't fully utilize it. Unless you put put effort in coding in a more Mac-only language. By Apple's system design, not software design N3V or any other Mac game maker choose. But we are in same discussion as with linux: platform specific programming. (well, not completely true as linux very well supports OpenGL 4.5 from 2014 and heavily pushing it to the most recent 4.6 from 2017 - but still, there is more to do than "just" the graphics API). In any case - it's time to phase out any 32-bit only software, software that does not fully utilize all (8) cores from a CPU and no one should get any GPU anymore with less than 4GB. Not seen any software on my system yet that fully utilizes all 8GB of RAM my box has but 16GB should be minimum to keep your hardware fit for a while. PS: OpenGL has no future to it's backward compatibility restriction. Successor Vulkan also brings the platform porting benefits OpenGL always dreamed of. yes opengl on the mac is crud, I think it does affect performance greatly , which was why I was asking Tony about metal. The real solution is of course to install bootcamp and play trainz on windows on the mac , reports are performance of games with the iMac and a RX 580 are about equivalent to the windows experience ( but of course no one has done so using Trainz . we are such a niche item ...) , I keep on meaning to do this as I could use the Gtx 970 I have on my Mac pro as it works perfectly well on everything APART from trainz, but of course I'd have to buy a copy of windows 10 , I'd rather spend that loot on an RX 580 and run it under osx even if its not as good as on windows due to the open gl hit just for convenience as i have all my other software such as photoshop is mac based.
. Of course the other question is, it absolutely necessary to run everything at the top settings ? . So far my 10 year old mac is allowing me to create a highly detailed 80 mile route and apart from the glitches for the last update ( which occurred on both pc and mac) i've had less problems running TANE on my mac than i have on windows. the ROG 750 laptop I have hasn't had a good run with TANE and the previous desktop PC was useless, it had good specs but I could never get it to work well. Whatever NV3 has done in the last update made it much more efficient for macs ,lets hope 2019 will improve on that. 64 gb of ram? 64? What on earth did you get that nuch for? Yeah maybe, I don't think that any mac has that high specs. PC is always going to be better then mac. Doesn't matter what it is. Gaming, work, video editing, audio editing... you name it, we can do it better, and cheaper. Well if you are that wall eyed, then there is no point talking to you thats not a discussion its just a blanket statement and blanket statements are invariably wrong and usually a sign of a closed mind .
. However , if you talking about mac users being rude, and yet you've been insulting us fairly regularly here. why not follow your own advice and keep your opinions to yourself and then we wont have any further discord. I didn't get that much , a know that hauge amounts of RAM do not improve TANEs performance, its the graphics card thats the most important item in general. you need to read my post, there are several iMac and iMac pro systems there , i am quoting current top specs of macs on the market , you said none of them are capable of running trainz on high settings, i was giving examples of machines that should run it . Don't you think a 16 gb vega 64 is capable of running TANE at high settings ? , even taking the poor performance of opengl into account on the mac ? Now the price of that system is insanely expensive and i'd never even contemplate buying it , but it should be good enough to run TANE even if it isn't a dedicated gaming rig. if you don't agree can you tell me why ? or are you just making statements to stir people up as you certainly don't seem to be doing anything other than bagging computers you don't like . Why do you feel the need to do that ? are you threatened by mac users ? , is our existence so repulsive to you that you feel the need to just bag us for no good reason ? anyway if you care to read this, you might get an idea of how well this card might work or not. The Radeon RX Vega 64 is an excellent first showing of AMD’s newest graphics cards with Nvidia GTX 1080-equivalent performance and the potential of so much more.The Radeon RX Vega 64 proves AMD is ready to reenter the world of high-end graphics cards with a part that performs just as well, if not better than, the Nvidia GTX 1080 and for slightly cheaper to boot. Underneath the surface, there’s much more potential in AMD’s Vega platform than just beating its team green rival. As Macs use the same components as PCs they can be just as high spec as a top end PC and the cost is very similar, the difference is Macs don't make cheap stuff using low end processors. Apart from the forget what it's call bit of hardware that makes it a Mac not a PC the difference is in the operating system and it's intended use. If Apple put a bit more effort into making Macs more gamer friendly with decent drivers etc then there wouldn't be a problem. Traditionally Macs are not gaming machines but used in Graphic design, Video and audio editing, Graphics manipulation and so on which they are very good at and it's only in the last few years that PC's have been able to more or less match them. Unfortunately I think Apple are more interested in the gadget market than Computer games. I still have my old G5 powermac tower, but the intel boxes are much better believe me ...... if you can get a modern graphics card set up on one of the 2012 intel towers its a good combo, but not for Trainz.... . Works fine on most other games , still not as good as it would be on a dedicated pc gaming machine, but more then acceptable. also one can boot into windows as well with boot camp or an emulator . id build a Hackintosh if i had the skill to keep it updated, but i dont like playing with the innards of computers, i want to use them productively . its the OS that makes me stick with macs over PC even though i have a ROG 750 with top specs which runs Tane ok, (but it doesnt do it outstandingly better then my 2010 mac Pro) but the best thing about the mac os is I don't have to be constantly tweaking and fixing the os like I seem to have to do on windows 10. Totally agree apple are more concerned with their toys ( phones , watches pads etc ) and this has meant that their desktops have suffered ,why on earth they cannot just make a desktop decent box with swappable parts is beyond me, which is why i stick with the older towers,. I used macs in high end media , photography and audio for many years, and we used PCs too, at the end of 7 years the macs were still going strong and all the PC's had been junked, even tho they were higher spec'd , they also had far more technician time spent on them and they took about 10 minutes to boot up on a network as all programs had to be loaded from the server. We found the macs much more reliable than PCs in general as they could be used as stand alone machines as well as being networked. , the extra cost was more then made up with the reliability factor. The out of box experience for setting up video editing was so much better then PC ,many times people would edit films on their home pc and then could not export them due to the fact that their machines weren't set up to correctly to do so. That was the LAN administrator messing up. Software is best loaded from the local hard drive. One of my summer students was working her second year in a different section and noted that Wordperfect took far longer to load than it did when working for me. The problem was the LAN Admin didn't understand that LAN speeds are measured in bits per second and hard drive access in bytes per second. Add in contention as multiple people try to load software at the same time and the LAN gets flooded you can't get more than 40% throughput if you try you get more collisions and throughput drops. I had a chat and the summer student who had worked with me previously she studied English sorted tho LAN out and how software was loaded. I'm looking forward to checking Trainz 2019! That was the LAN administrator messing up. Or the comparison is between a thin client and a fully configured workstation - not a reasonable comparison. Whatever the cause, its been the same in every place I've worked in ,taking up to 10 minutes for a PC to boot up and load. the Macs were used for video, audio, 3d work and photography and the PC'S mostly for CAD and photography. Part of the problem when video editing on a network in education is that the video files you create ( often huge ) need to be stored so the user AND others working on the project can access the work. in all the windows networks I've used ( in education ) their security is placed into a higher status than the user experience, so when using the network to store the work, only one user can access a project. if that person is not present the work cannot be accessed. Also bandwidth for uncompressed video is huge and thus most institutions just don't have it.The network bottlenecks within seconds and you cannot import to the software program . Thus the need to be able to import directly to the hard drive not the central server. I've only seen this done at all on PC's in one campus and it did not work well overall because only the logged on user themselves could access the files. . The software on all the computers was the same across campus . The entire adobe creative suite, and office and a few other smaller programs. There was Autocad and 3d max on the PCs and on the Macs there was Final Cut Pro , IMovie, Motion 5, Logic and Carrara 3d. plus a huge amount of fonts and sound effects that were not used on the pc's so it more or less was about even software load . The macs had all of this software on their hard drives, so it was available on bootup , they were both standalone and networked whereas the windows machines were only networked. The point is, the macs could be used as stand alones because its extremely difficult to mess them up so badly they cannot be used even with a generic login , whereas the windows units could not be set up like that ( for whatever reason the IT guys had ) and when being used by a group this was a real issue. We could never set up video editing correctly on the network with Windows. the macs worked out the box for this and other media tasks and saved us many thousands of dollars in tech time thereby justifying their purchase, for whatever reason they lasted two years longer, even though they were only core duos and the windows machines were quad cores. Both types of computer had about equal use although the macs were used by fewer staff who possibly looked after them more than the others did ( against vandalism ). Undoubtedly more boxcar reskins! The DLS abounds with them! 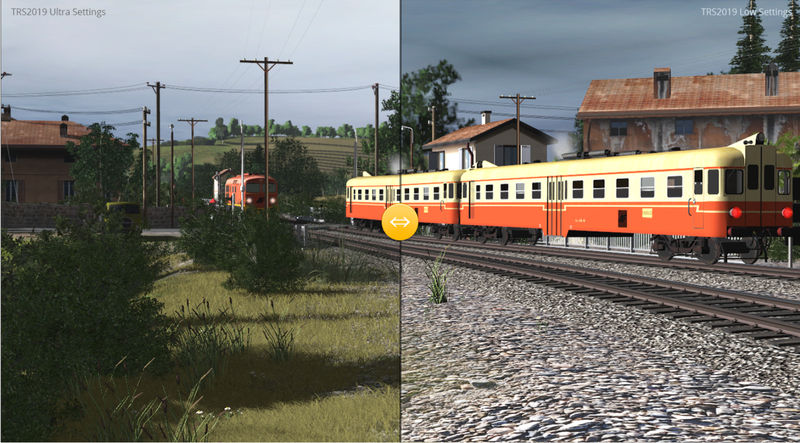 A large proportion of the Trainz community would recommend that you buy any version of Trainz, directly off N3V. Thank you . I say: variation is the spice of life .